Morphuts are based on standard 8' x 4' (2.4 x 1.2m) panels. 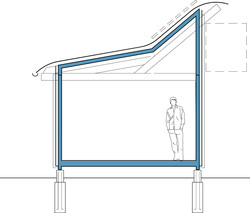 The primary timber frame is spaced at 2.6m (8'6"). 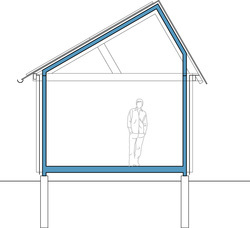 We refer to the structural modules as 'bays', and the standard basic arrangements are shown below. These can be adjusted or combined to make bigger units. (If you're looking for something smaller, you might care to take a look at our MorphPODs, click ﻿here﻿). 3.8 x 5.5m 12'6" x 18'0"
3.8 x 8.2m 12'6" x 26'9"
3.8 x 10.9m 12'6" x 35'9"
The roof shape can be whatever works for your site and circumstances, within reason.